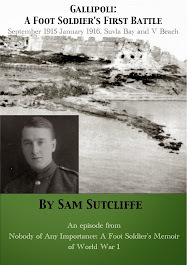 Sam’s Memoir(1) – paperback and e-book – and the e-excerpts from it are now available in their third and final editions with added Endnotes and, in the Memoir, added documentation. All proceeds from all versions of Sam’s Memoir will always go to the British Red Cross – and the current running donations total as of April 3, 2019, is £4,078.85 (I can't update it in the Donations box below because the "edit" tool has vanished!). Apart from the jaw-jaw, war-war still proceeded in eastern Europe. While the Red and White Russians’ conflict in the Urals stalled for a few days, Bolshevik forces took a heavy loss in the Battle Of Lida April 16-17), part of the Polish-Soviet War (February 14, 1919-March 18, 1921). Having camped outside the town (in present-day Belarus) since mid-March, the Polish Army attacked the Russians – who’d lately taken it after German occupation – and drove them out, pursuing them eastwards with cavalry. This signalled a strategic shift by the newly independent Poles who decided to stop fighting the Ukrainians and concentrate on their Russian border. Much further east, in the Punjab, five days of rioting followed the Massacre Of Amritsar (April 13) – connected to World War I because the Punjab had been the main source of recruitment for the Indian Army which fought at Gallipoli, in the Middle East and on the Western Front. Last week, Sam ventured into a failed attempt at romance with one of the village schoolteachers – and also took to weekend walks across the fields to Littlehampton, 2.5 miles west. There he enjoyed the usually deserted YMCA – missing its departed GI clientele – for big lunches served up by the underemployed ladies in the café. ‘More than once, when I wandered into Littlehampton, I found myself walking behind a girl quietly dressed in a calf-length, Navy-blue overcoat. She usually turned right, as I did, into the High Street, at the far end of which stood the YMCA. Then, every time, she would walk straight past the building and I would climb the steps… beginning to feel curious about her and where she was going. She must have despaired of anything coming of the haughty act and this time when I followed her along the High Street – by chance as ever – she stopped in her tracks, turned round, confronted me and smiled. “You’re not going to duck into that dump again, are you?” she asked. Of course, I quickly adjusted my thinking and promised never again to do that if she was likely to be available. Nothing exciting came of it, but we met often, walked around the district and usually called at a country inn for a couple of drinks… Something different, then, to make the fairly long walk to Littlehampton worthwhile. I treated her with the respect due to one of her obviously high moral standards. But when, on one of our pub visits, she told me she enjoyed my company best when I’d got a couple of whiskies under my belt, I wondered if I was perhaps overdoing the gallantry(3). Resting one day on my mattress in my little room just below the roof of the old mansion, I heard a knock on the door and in came our Sergeant – a boozy-faced old twit, I thought – accompanied by a tall lad. “Hope you won’t mind sharing with this young man,” said the gaffer and, of course, I made him welcome. I said, “Come in, George, very glad to have you for a mate after all these years!” – expecting, as I did so, a sign of recognition from him… Marvelling at the strange coincidence of it all, I was staggered when he said it was great I called him by his proper name before he’d introduced himself; at which, I realised this was a stock joke of his – he thought I’d called him George because, in the Army, everyone called you George if they didn’t know your proper name. It shook me for, as a pre-war youngster, this lad had worked, just over Southwark Bridge from Lake & Currie’s offices, in the laboratory which assayed mineral samples sent in by our firm’s mining engineers. General dogsbody George(4) trotted over to the City with the results and took back anything that needed testing. I often chatted with him while he waited in the outer office I occupied with the old “Sergeant” commissionaire; I knew him well, even knew about a kidney complaint which caused him to become drowsy and fall asleep regardless of where he happened to be. He had told me he lived in a block of flats and had to climb several flights of stairs and sometimes sat down on a step and dozed off. Unusual for a boy of 15 or so, but that was about the only result of his complaint that bothered him. (4) I can’t give you a back-reference here because George didn’t get a mention in the section about Sam’s two years working for Lake & Currie. 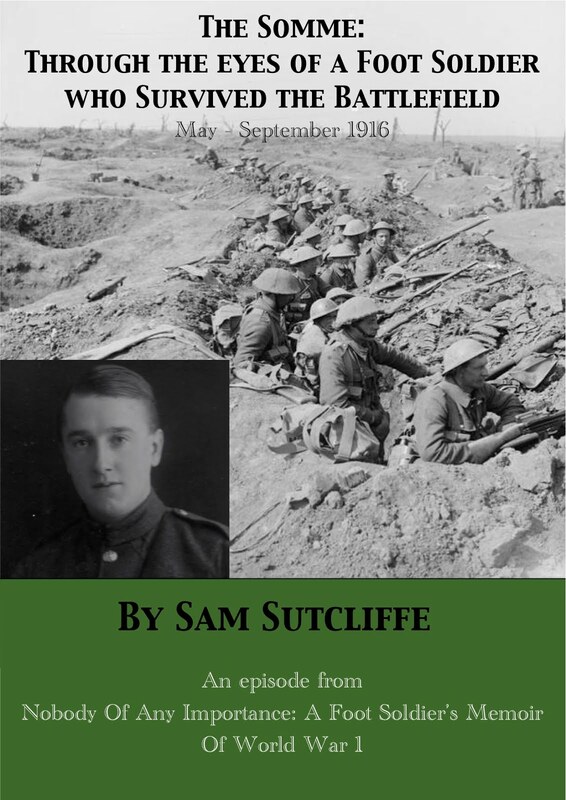 Even allowing for my father’s appearance having changed somewhat between 1912-14 and 1919, ages 14 to 20, with added impact from his war experience, no doubt this odd episode mostly reflects my father’s extraordinary memory encountering a very bad one. 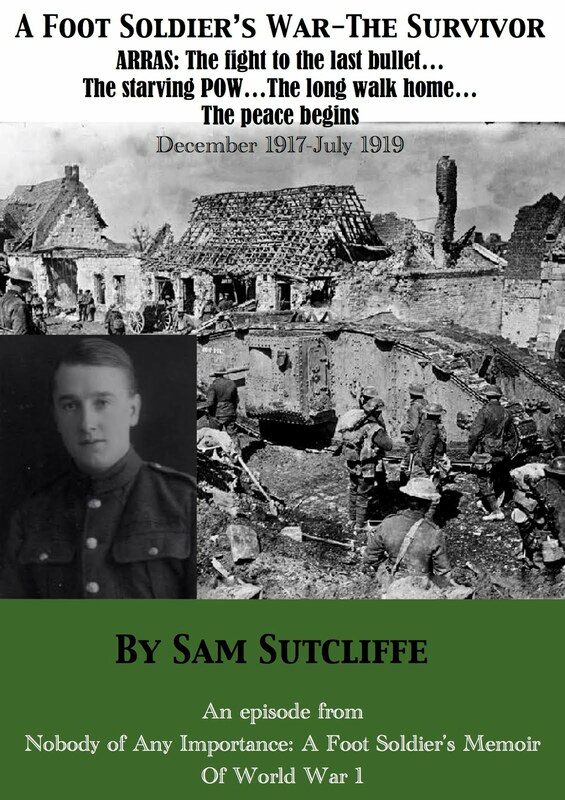 Next week: Sam “fraternises with the enemy” again; the mandolin-playing Unteroffizier and – while rebuilding the Arundel river bank – fellow former front-liners Willi and Hans… “too young to hate anybody who did them now harm”. 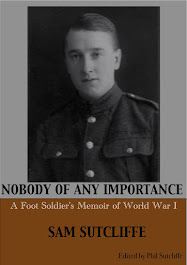 (1) In his 70s, Sam Sutcliffe wrote Nobody Of Any Importance, a Memoir of his life from childhood through Gallipoli, the Somme, Arras 1918 and eight months as a POW to the 1919 Peace parade.